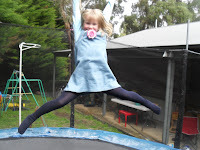 About a few weeks ago, (Same day as when I published dress post) my sisters and I were jumping all over the trampoline. 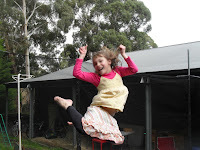 We had a fun time and played games especially for the tramp. We also got some great pictures of us in the air! We had some funny poses of us doing different "moves" and they were pretty funny. Here Are Some Of The Pics!!!!!! hahahaha! thats funny with u and ur sisters! r u happy liz is gone on camp? how r u buy the way?